These photographs will show you the effect of lighting scene to the hospitality industry, specially for the hotel guest-room application. Simple & smart solution to make guest enjoy room more, to make them more relaxed, build their mood or perhaps helping guest feel like in their own room at home. Guest will easily set the lighting scene with control button that placed near their bed. below : lighting scene controller near bed. there are 4 lighting scene : hello, escape, runway and flirt. 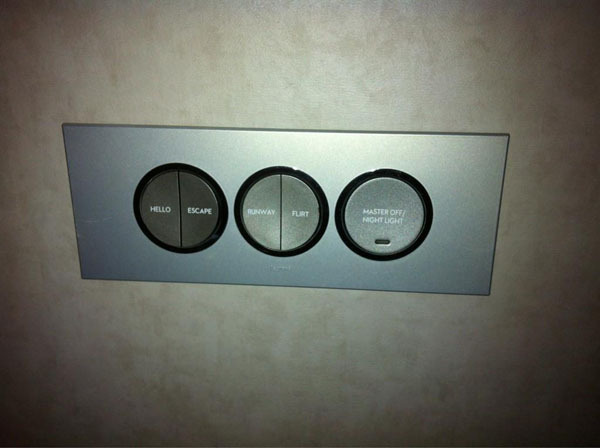 and one button for master off/night light.